The pride of the City of Airdrie is Genesis Place, a community facility that features aquatics facilities, a gymnasium/field house and fitness center, in addition to indoor and outdoor running tracks. In September 2013, the development of the Genesis Place complex was completed with the opening of the Twin Arena. The 120,000 square foot Genesis Place Twin Arena features two NHL-size ice rinks, a 250 seat grandstand for each rink, four meeting rooms which can seat up to 70 people, a conference room, and a pro skate shop. In addition to providing the community with meeting space and public skating facilities, the Twin Arena is used by the Airdrie Minor Hockey Association, Airdrie Ringette Association and Airdrie Skating Club. According to Paul Hurst, Network Administrator for the City of Airdrie, it was important for him to be able to provide Internet access to visitors around the ice rink, youth hockey coaches on the ice, and people in the meeting rooms. With as many as 250 users in each of the two ice arenas and another 100 users in the meeting rooms, the wireless network needed to be very reliable and had to perform well. 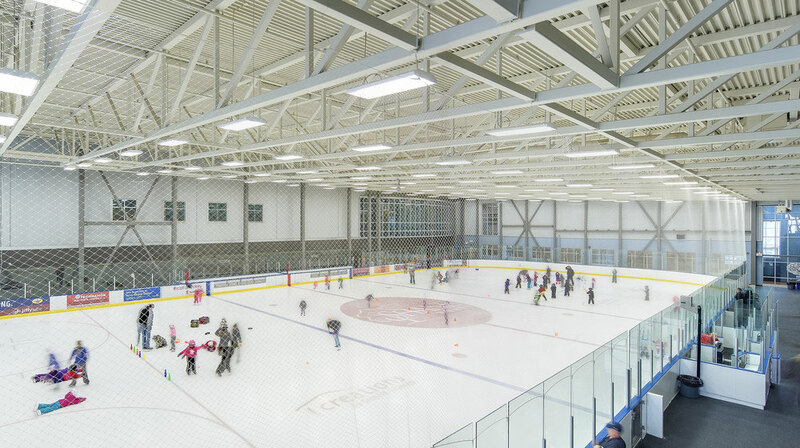 Having deployed EnGenius access points extensively in other projects throughout the City of Airdrie, Hurst knew that he would be installing EnGenius in the new Twin Arena complex. He selected the EnGenius EAP350 high-powered, long-range ceiling mount access point. The EAP350 features an unobtrusive smoke detector design and supports 802.3af Power-over-Ethernet for quick, easy deployment. According to Hurst, the wireless network has performed flawlessly since the facility was opened to the public. Using EnGenius EZ Controller software, Hurst is able to monitor the performance of each EAP350 and the network usage of attached client devices to minimize the misuse of network bandwidth. Learn more about the latest wireless products from EnGenius.